North West is famous for being the child of Kim Kardashian and Kanye West just as Blue Ivy is popular for being the child of music legends – Jay Z and Beyoncé. In the political scene, we know Malia Obama and Chelsea Clinton respectively because of Michelle and Barack Obama; Hillary and Bill Clinton. A new entry to the roster of children of famous political personalities is Arabella Rose Kushner, the daughter of Ivanka Trump and Jared Kushner. Let’s learn more about her. Who Is Arabella Rose Kushner? Arabella is the first child of Jared Kushner and Ivanka Trump. She has two siblings and was born on the 17th of July, 2011 in New York. Her parents, Jared and Ivanka started dating in 2005. The couple met through mutual friends. It wasn’t all smooth sailing for her parents at the beginning of the relationship. The couple encountered negative reception from Jared’s parents and they broke up three years into their relationship in 2008. Their break up, however, didn’t last and they got back together to be married in 2009. They were married in a Jewish ceremony on the 25th of October, 2009. Arabella Rose Kushner’s mother, Ivanka has dived into various careers. She is a former model, who was active during her time as a high school student, modeling for brands like Tommy Hilfiger and Sassoon Jeans. As a fashion model, she worked the runway, wearing different brands like Versace, Marc Bouwer and Thierry Mugler. Since she quit modeling, she’s been a businesswoman, fashion designer, author and television personality, appearing on her father’s television show, The Apprentice. She has co-hosted Miss Teen USA, was a guest judge in Project Runway and had a cameo appearance in Gossip Girl. As a writer, she has published two books, The Trump Card: Playing to Win in Work and Life and Women Who Work: Rewriting the Rules for Success. Both books were published in 2009 and 2017 respectively. Ivanka is the daughter of the President of the United States, Donald Trump and also holds an official White House position as the Senior Advisor to the President. Arabella’s father, Jared Kushner has a less glamorous career. He is the eldest son of Charles Kushner, a real estate developer. He attended Harvard University and joined his father’s company after graduation. Since he completed his education, his career endeavors include being an investor, real estate developer and newspaper publisher. During his role as the chief executive officer of Kushner Companies, he increased the company’s presence the New York City real estate market. During his time as a newspaper publisher, he also increased the presence of The New York Observer in the newspaper market. Although Arabella Rose Kushner’s father started his political life as a Democrat, donating to various Democratic campaigns, he made a switch to the Republican party after he was disappointed by the Barack Obama administration. Kushner joined the Trump presidential campaign and helped Donald Trump win the Presidential election through a series of moves that has been described as “the locus of his father-in-law’s Presidential Bid”. Just like her mother, Arabella’s father Jared is also the Senior Advisor to the President. He was appointed on the 9th of January 2017. At the young age of 7, Arabella Rose Kushner is being raised Jewish as a result of her parents’ religion, who are Modern Orthodox Jews. When Arabella Rose Kushner grows up, she will be the leader of the Ivanka-Jared household. She is the eldest child of her parents’ three children. She has two younger brothers, Joseph and Theodore. Arabella is part of the rank of political and influential siblings who know Mandarin. She took up Mandarin as a second language and at age seven, she’s already fluent in it. Provided the proletariat doesn’t rise up and steal the wealth of her parents, Arabella is set to be worth a gazillion dollars when she’s older. Her parents have a combined net worth of over $1 billion dollars and a significant portion of it will be hers. Just like her mother, Arabella has already shown signs of a career spent hugging the camera. She is already a prominent feature on her mother’s Instagram page and has her own Instagram account already. 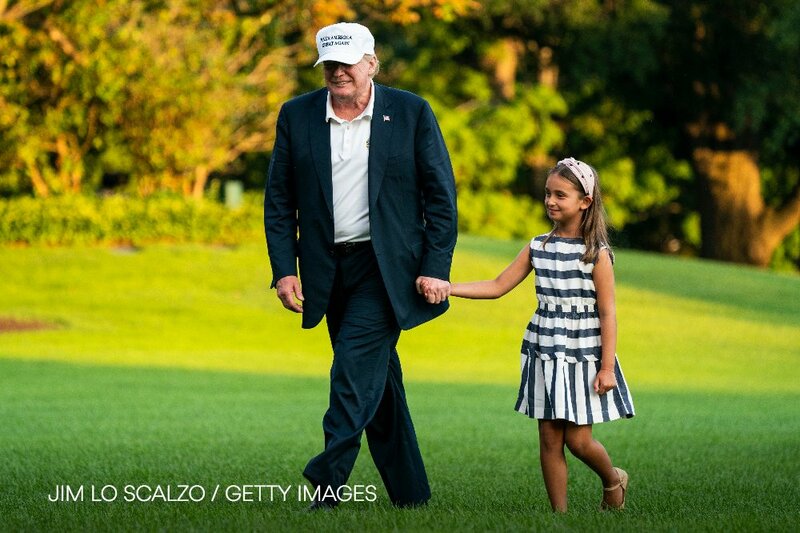 It is a curious thing to be a relative of Donald Trump and amidst all the wealth and multiple children, Arabella Rose Kushner places as the third grandchild after Kai Madison and Donald Trump III, the children of Donald Trump Jr.
Rich people make sure their children are equipped with several skills, especially those that help brain development. Arabella is no exception. She’s a piano player and her mother regularly posts videos of her on the instrument.